Soon after his birthmother contacted him for the first time at the age of thirty-nine, adoptee Gary L. Stewart decided to search for his biological father. His quest would lead him to a horrifying truth and force him to reconsider everything he thought he knew about himself and his world. The Most Dangerous Animal of All reveals the name of the Zodiac for the very first time. Mustafa and Stewart construct a chilling psychological profile of Stewart’s father: as a boy with disturbing fixations, a frustrated intellectual with pretensions to high culture, and an inappropriate suitor and then jilted lover unable to process his rage. At last, all the questions that have surrounded the case for almost fifty years are answered in this riveting narrative. The result is a singular work of true crime at its finest—a compelling, unbelievable true story told with the pacing of a page-turning novel—as well as a sensational and powerful memoir. Very well-done. I suggest getting this in print or ebook format as opposed to audio because some of the best evidence presented here is shown explicitly in ciphers and codes created by the Zodiac Killer. 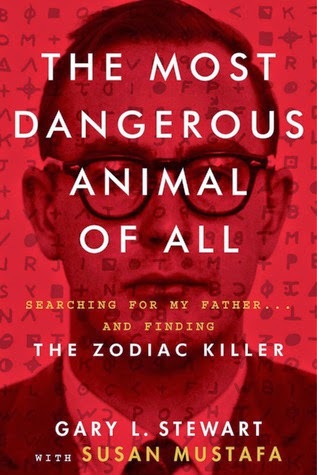 The visual impact played a big role in convincing me that the author is probably correct in assuming that his biological father is the Zodiac Killer. Was I convinced enough to find him guilty in a court of law? Probably not - there's definitely room for reasonable doubt. But I was convinced in my own mind that he is most likely correct in his assumptions. The authors do a great job of presenting their evidence and backing it up with facts. If you're a fan of true crime, this is a must read. I think it can cross over, however, to fans of mysteries and thrillers as well. It reads like a novel and will certainly keep your interest. It's also not presented in the sensationalized way that true crime is generally perceived as embodying. If you loved Serial, you will love this book. It's a great story and has all the same conflicting information and subtle clues that could point in any number of directions. And, like Serial, it has a somewhat open ending that allows the reader to decide how well Stewart has made his case. There are entire Reddit forums devoted to this story and, if you enjoy the book, they're perfect for some internet rabbit holing. Thanks to my local public library for providing me with a copy of this one! I really liked this as well! I love the movie, Zodiac, with Jake Gyllenhaal so I was really interested in this. Although I think this author's theory is different than what they conclude in the movie.. Can't remember for sure.